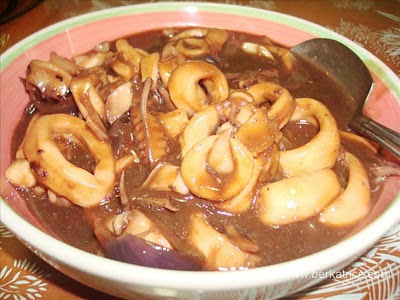 To prepare the squid, cut down the center of the body, creating rings. To make the sauce, combine the oyster sauce, soy sauce, sugar. Stir to dissolve the sugar and set aside until required. Heat the oil in a preheated wok until almost smoking. Saute garlic and onion. Lower the heat slightly, add the squid and stir fry until they curl up. Pour in the sauce.. Leave to simmer for 3 minutes until thickened. Serve immediately. Yummy, I'm going to save this recipe. I love squid! But I don't really know how to cook it here at home in the USA. Defintiely going to try this!